It’s been quite awhile since I’ve made an assigned French Friday with Dorie recipe but this tomato covered tartlet made with purchased puff pastry looked like an easy and delicious way to take advantage of a surplus of tomatoes. We enjoyed our tartlet for an appetizer last night before dinner but I also think it would make a nice lunch served with a light green salad. It’s sort of an Italian/French hybrid with a caprese salad on top of a traditional puff pastry base. After brushing on a thin layer of tapenade, I had fun arranging slices of tomato, mozzarella with torn sweet basil leaves on top of the small tartlet. I decided to make it the same size as a baking sheet that fits in my small convection oven as I didn’t want to turn on the oven to bake during our warm Summer week. I brushed on a thin layer of olive oil with a sprinkle of sea salt and freshly ground pepper before serving. It was a success and I will make this simple puff pastry tartlet again, maybe with figs, aged goat cheese and a drizzle of balsamic vinegar for a quick appetizer. 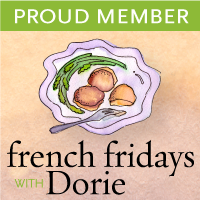 Please check out this link to French Fridays with Dorie to see an array of tartlets and if you like, consider picking up a copy of Around My French Table by Dorie Greenspan and cooking along with this group. Roll the puff pastry into a slightly bigger shape, I made a shape that fit on a 1/4 baking sheet. Roll over the edges to make a border and prick the bottom all over with a fork. Line the baking sheet with parchment paper, lay the puff pastry on top and cover with another sheet of parchment, top with another baking sheet or pan to weigh the dough down. Bake for 15 minutes, remove the top baking sheet and parchment, continue to bake until puff pastry is browned. Spread a thin layer of tapenade on the puff pastry. Arrange the tomatoes, mozzarella and basil leaves on top, drizzle or brush on olive oil. Season with sea salt and pepper, drizzle on balsamic vinegar, if you like. Serve cut in small pieces for appetizers or larger pieces for a starter or for lunch. What a scrumptious appetizer, Patty! I could dine on this every day of summer :). Thanks Laura, it’s such an easy recipe! Just gorgeous, Patty! So glad our group is getting back on track! I think this tart has so many possibilities! Have a fabulous French Friday! LOL! I like easy but pretty appetizers before dinner although mine are usually whatever I can stuff in my mouth while cooking ;P Thanks for sharing! Thanks Suzanne, This is such an easy appetizer! I like the fact that there’s an olive tapenade underneath all those juicy tomatoes! This really reminds me of France, particularly when I was travelling through the south! They make gorgeous tomato tarts there. Yours look fantastic, too! Burp! Yours looks lovely I thought a large one might be great next time around! Wow, Patty this looks like my kind of dinner. It’s beautiful and very delicious looking, any leftovers? Just beautiful! Love the pics and the family sized tart! I made mine individual. Your new site is fantastic! What a gorgeous tartlet! Your photos are always so beautiful. I’m hungryyyyy, Patty! Yeah I agree this could be a nice lunch packed with flavor! summer quick recipe that has a lot of potential. Lovely photos. Anything with puff pastry is a perfectly delightful treat! Your tart looks and sounds divine. I need to make this soon since hubby would adore it. Perhaps for our friday night wine and appetizer night. Hope you have a GREAT weekend!!! How fun Patty. I just made a recipe with puff pastry, and it was heavenly. Mine was leek, goat cheese, and tomatoes. So good. This also looks delicious (but I’m a HUGE fan of puff pastry) Thank you for sharing! Great minds as all I could think about was goat cheese and figs too… my favorite toppings when I break out the puff. This certainly looks good! Simply stunning, Patty! Your puff pastry really puffed beautifully!!! So beautiful. This is just the sort of thing I like to eat in the summer, and your version is stunning! Beautiful! Love your sub of heirloom tomatoes! I’d like to come over the next time you make this tartlet–looks so good and I love the way you styled your shot, Patty. So fresh, and delectable! I like to use frozen pastry too. That’s a beautiful looking tomato tart and it would be the perfect thing to serve if having the girls over for lunch. Your tart looks devine Patty – love the chunky tomatoes and cheese. Amazing looking tartlets…love the heirloom tomatoes! We really enjoyed these…they were so delicious!! Have a great weekend, Patty! Hadn’t seen your new blog layout until now. Gorgeous! So elegant and easy to navigate. You Go Patty! As for your tart, I was wondering about making a bigger one instead of individuals. So glad to see it turned out so lovely. Great post! I love the way you let the edges puff! I also think your figs and goat cheese idea sounds wonderful. This looks incredible! What a beautiful tart!!! I love the idea of arugula on top! Your tartlets looks great! I like how you tartlet looks, Patty, but I cannot figure out how you kept the inside of the puffed pastry from “puffing” and have it not affect the side crusts. I know you did the prick deal but you also said you weighted the pastry itself. But, you obviously did not weight the crusts. I tried to figure out how you did that with your cookie sheet. I have a few pounds of fresh figs in the freezer from a neighbor’s tree so might give your fig idea a whirl. Very beautiful tartlet. This tart looks amazing! So many great flavors in one little bite! Those heirloom tomatoes make it so beautiful and special looking! I would eat this tart every day as well! Your tart looks so abundant, fresh and colourful! I thought it was a great outcome for such a simple and easy recipe! what a great looking and I bet delicious tarlet. Perfect for a quiet summer evening. I love your puffy edges! This was a really quick one but a tasty one too! Wow Patty the tartlet looks delicious! I could eat it for lunch or dinner, as you said, with a green salad on the side.